Many of us have one - an ancestor who was a stinker, put quite frankly. And this can be quite a can of worms when writing and documenting our family histories. I descend from William Nickerson, a fellow who gave the colonial government quite a run for their money back in the 1600s, and was well-documented for it. There are amply written, unbiased sources documenting his behaviors and punishments, and it's a part of who he was. He poses no problem for me in writing the family history - he was a character, and his own person, and no one is likely to be offended by what I write about him. Then there's Aunt L. She's not so far back in history, having departed this life not quite 30 years ago. Many in the family still remember her. She left no descendants that might be more easily offended than the rest of us. But still, how exactly do I handle her in the family history? She was my grandfather's aunt, and out of his own mouth come the memories of her locking he and is brothers in a dark closet and terrorizing them, and calling them names, because she hated their father. Or all of the Christmases that the girls got gifts and the boys got nothing. One of her nieces has less than fond memories of her as well, saying that she tried to cheat their mother out of anything that she could, be it family heirlooms, inheritance, or their brother's insurance money. My own memories are much tamer, but then, Auntie was quite a bit older by the time I knew her. Once a year, at Christmas, we would gather at her house for a Christmas dessert and open small gifts. She got out the family china, and spent time trying to tell us about her father and mother, and trying to show a largely (unfortunately) uninterested bunch of people about the family history. No one, including me, seemed to care at the time. Under that tame exterior, though, still lurked the same anger and temper that she had as a young woman. After a bad fall, she ended up having to go into a nursing home. She was furious. And it was my grandfather, the same little boy she terrorized as a child, who looked after her. He and my grandmother went to her house those last few years she lived there, and mowed the lawn, took her shopping, helped her clean, and visited with her... and in the nursing home, they went out twice a week to see her. One particular week, they took me with them. I was standing in the doorway when Auntie L., in a fit of rage, suddenly kicked her trash can violently out into the hallway. Two older gentlemen with walkers were approaching when the projectile shot out of her room, ricocheted on the opposite wall and came to rest in the middle of the hall. Without missing a beat, one of them said, "Well, looks like another one kicked the bucket!" Nursing home humor... not a great situation, but it has ended up being one of my favorite memories of Aunt L. It was so very... her. So, do we try to leave future generations with positive impressions of their departed family members, or do we do our best to capture them as they were, warts and all? Should the wishes of other family members be taken into consideration, and if so, to what extent? Do we, as family historians, respect truth, or respect the dead? Is there a way to to both? A year or two ago, I checked the 1880 Agricultural Census available at Ancestry.com for two of my Ancestors from Peoria County, Illinois: William Graves, and Lawson Lair. While I was able to locate them and read their entries easily, the headings on the forms were nearly completely illegible – so much so that the data was meaningless. I tried different scans from neighboring areas, and looked around the internet for a blank copy of this form, but to no avail. I emailed Ancestry requesting a blank form, and received no answer. Today, I tried again. The scan has not changed in quality, unfortunately, and I still saw no link to a blank form at Ancestry. Overall, I’m a happy Ancestry customer, but this major oversight for this database left me disappointed. Data isn’t worth anything if you don’t know what it means. However, eventually a Google search pointed me to a wealth of information on not only the 1880 Agricultural census, but others. Blank forms were provided, as well as background information. This information, in the form of a pdf, can be obtained at the government’s census website here. The information provided by this enumeration gives a good “snapshot” of what life on the farm was like – at least during the year 1879. Land ownership, or the nature of the rental agreement, is the first item to be addressed, progressing into how much land is both improved and unimproved. Farm values are noted, as well as the worth of the implements and machinery owned by the farmer, so comparing to that of their neighbors, it was easy to get an idea of the financial standing of the farm relative to its neighbors. The details help forge a picture of the farm as it was then – was livestock raised, crops planted, or both? Did the family keep milch cows? Did they produce butter or cheese? How many horses did they keep? Did they keep poultry, and if so, how many eggs did they produce? Sheep and Swine details were also given. If crops were planted, what kind? How many acres? What was production like in that growing season? These agricultural censuses will differ in what specific crop questions were asked, depending on region of the country. Orchards, vineyards, and bee-keeping were also addressed. Looking at the data for Lawson Lair, who was at the time 47 years old with a family of nine, owned an 80 acre farm just west of Princeville. With farm values of his immediate neighbors ranging from $2,600 to $15,000, Lawson’s farm was toward the bottom at $3,200. Interpreting this data isn’t always straightforward, however; other sources paint a different picture of Lawson, who owned property in the nearby town of Princeville, deriving a great deal of future income as a landlord. He passed away with quite a tidy sum of money accumulated. Had I not already known this, I might have been tempted to decide Lawson was financially compromised, based on the value of his farm. Lawson had 4 milch cows and sold 450 gallons of milk in 1879; however, they didn’t make butter or cheese on the farm. He had 45 head of swine, and 40 barnyard poultry which produced 125 dozen eggs over the previous year. With his family of nine, this averages out to 3 eggs per person per week, which leads me to believe they produced eggs primarily for their own consumption. Regarding his crops, he grew Indian corn, potatoes, and sorghum, from which he produced 90 gallons of molasses – far more than his immediate neighbors who grew sorghum. All in all, this was an interesting look at the 1879 picture of Lawson’s farm, and that part of his life. The most significant piece of information I learned was that he was not as invested in his farm as I had imagined – he made his money from other means. Previous farm schedules may paint a different picture. Every little piece of the puzzle helps to put flesh on the bones. I recently posted about gleaning some very helpful hints from envelopes. After I thought I had gotten all the additional information I could from them, I was surprised once again. I had been dealing with two addresses: 1605 Market Street and 16217 Manhattan Place, the former belonging to my great-grandparents, Pete and Ella Christensen, and the latter belonging to their son, Clarence. After Ella’s death, when Clarence was married with a child, they traded houses, as Pete’s was a much larger home. After having gone through most of the letters and envelopes, I realized there was a third address, 16029 Manhattan Place. Due to the similarity to the other Manhattan Place address, I overlooked it completely. It was an early return address for Pete and Ella Christensen in Gardena – they apparently did not move directly into their home on 1605 Market (162nd) Street. My mother confirmed that they lived in a smaller home for a time when first moving to Gardena. I then noticed another address: 1605 162nd St. I was struck by the fact that the house number was the same as that of Pete and Ella’s house, but was on a letter written by Clarence’s widow in the 1960s. Since they had traded houses with Pete, this would tend to confirm my suspicion that 162nd Street was once Market Street. The return addresses, along with the postmarks, should help me pinpoint exactly who lived where, and when. It’s finally happened – I’m tired of working and cleaning around the boxes of genealogy goodies I brought up from the basement months ago. I’m working on the many storage bins full of this and that, trying to make sure everything is scanned, and put into archival sleeves in three ring binders. My hope is that by putting things in binders, the originals will not need to be “disturbed” nearly as much, plus, I’ll be able to find things a little more easily. I’m finding many things that just aren’t made for a binder, so I’ll still have boxes, etc. of things, but it should be much more manageable with fewer, and well-labeled, boxes. I’ve learned a lot this week, but first and foremost is the need to go back and review old documents with a fresh mind. I found a number of old letters from my great-grandparents, Pete and Ella Christensen, after they moved to California in 1946. I had these items scanned and transcribed, but decided to print out the transcription for each letter, put it in a sleeve, with the original kept in the envelope behind the transcription. But this time, I noticed the envelopes. Ten years ago, when I first scanned these letters, I completely overlooked their value. 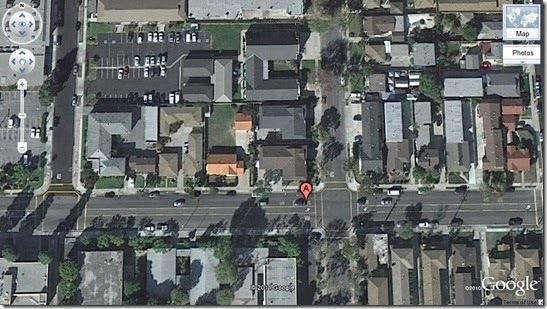 As I mentioned, Pete and Ella Christensen moved to Gardena, California in 1946. Ella passed away in 1952, and her daughter Lillian and family (of which my mother was one of the children) moved to California for a year. For some time, I’d tried to find where their home was located, but apparently street names had been changed at some point, as Market Street was no longer shown anywhere in Gardena. I sat down with my mother, and we attempted to find the general vicinity of the house, based on her memories of landmarks from 60 years ago – an elementary school across the street, and a church to the back of the house, but the memories were too faded to remember the names. As one could probably predict, it wasn’t very successful. Then came the envelopes. As my mother recalled, Pete and Ella’s son Clarence lived a short distance from the house on Market Street, and I just happened to have a couple of letters Clarence had written with his return address on the envelope. Luckily, Manhattan Place must not have been included when the street names were changed. His house appeared to be on, or near the corner of Manhattan Place and 162nd Street. We knew it was pretty much a “straight shot” to Clarence’s house from Pete and Ella’s. Right above the “A” marker would have been where Pete and Ella’s house stood – there’s now a house behind it where the lot of fruit trees stood, and behind that – a Seventh Day Adventist church. Toward the bottom of the picture, in the center, is Denker Elementary School. I feel comfortable that this is where 1605 Market Street was located, and where my great-grandparents lived. I tried to find information on street name changes in Gardena in the 1950s, but there’s nothing online, so I will need to get confirmation from the city by snail mail. I love to do research. I've been known to work on other peoples' ancestors when I hit an impasse on my own. But I also love to see the fruits of my labor in my home in the form of photos, and particularly photo displays. I'm not sure if my family shares my enthusiasm for this sort of decorating, but no one has complained. Then again, I'm not sure they realize that not everyone decorates in Early American Ancestor! I like to find common themes in grouping photographs. This simple grouping to the right is of three brothers - the three sons of Earl and Mary Seeman. Earl died young, and two of his sons died in middle age. Here, they are pictured "together." The next display is a "mother and child" theme. The top photo is my great-great grandmother, Alfhilde Monsen with her oldest child, daughter Gabriella ("Ella.") Alfhilde's husband, Gabriel, was a fisherman in Bergen, Norway. One day he went off to sea, and a storm erupted. He never returned, leaving Alfhilde to raise her three children alone, struggling to provide for them. The middle photo is Ella and her oldest child, daughter Lillian. Ella came to the United States at age 17 to find a better life, later sending for her mother. She married a Danish immigrant who owned his own bakery, and they raised five children on the plains of South Dakota. The bottom photo is Lillian with her oldest child, daughter Betty, my mother. Lillian married a farmer, and they had four children. If I only had another frame to match, I could have added my mother holding me, her oldest daughter. But here, the pattern ends, regardless of how many frames I could come up with. I love to find unusual frames, which means hunting flea markets, thrift shops, and garage sales. Most of the time I have no idea what I'm going to do with my finds, until just the right idea presents itself. This grouping is one of my favorites. This standing frame holds only three photos. I found it at a thrift shop several years ago. The photos are of my grandmother - as a teenager, as a middle-ager, and finally, in her senior years. I like the "snapshot" it gives of her life, and the frame itself looks like something she would have had in her own home. With the displays above and below, I wanted to give a "nod" to our ethnicities. 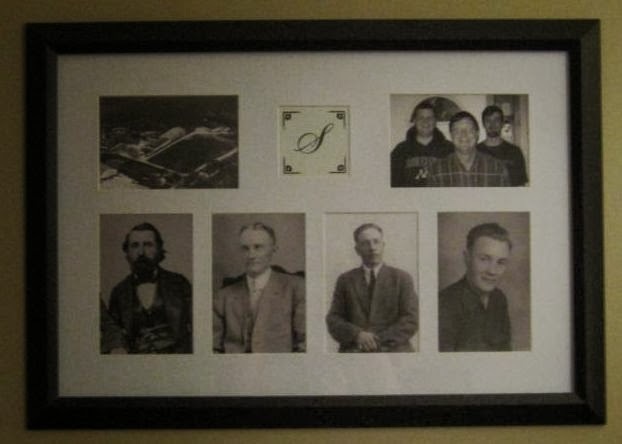 Above are pictured my husband's family's generations, starting top left with an aerial photo of the family farm in Schleswig-Holstein, and below that, immigrant Hans Seemann, and moving toward right each man's son. At top is the current generation. I made one of these for my husband, and one for each of our sons, and I made a similar display for my husband's brother. Below, I pay tribute to my Norwegian ancestors. I also learned how hard it is to frame a silk flag squarely! 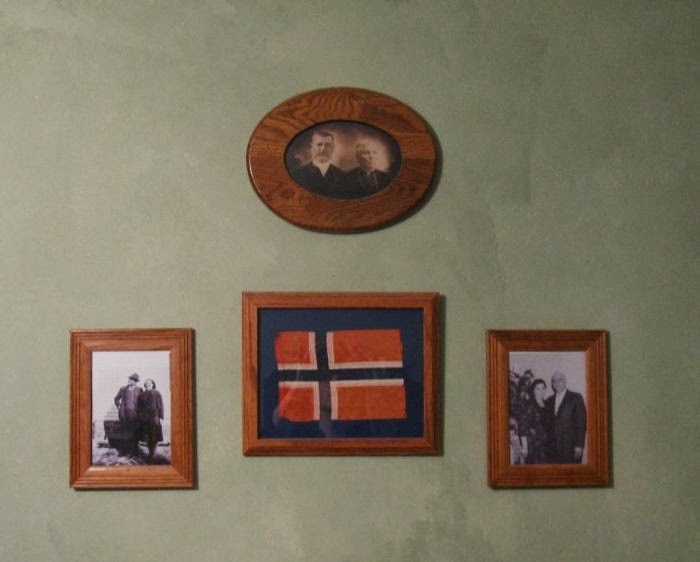 At the top are my great-grandparents, Andreas and Anne Larsen, pictured in an oak frame made by my father (these were his grandparents.) To the left is their son, my grandfather Adolph, with my grandmother Agnes. They left Norway for South Dakota in 1923, with one child and another on the way. Agnes died at age 48, and Adolph then married his childhood friend in Norway, Lisa, and she joined him in the United States in 1952. The are pictured at right. This display honors both of my "grandmothers." 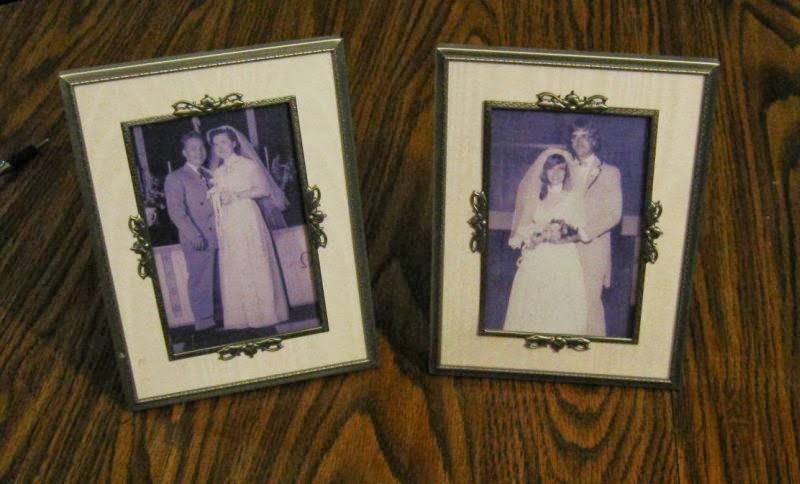 I had two wedding frames, and wanted to put the black and white wedding photo of my in-laws in one, but was at a loss about how to use the other one. I decided to print a black and white copy of one of our wedding photos, in as similar a pose as I could to that of my in-laws. This is the result. This is a common type of frame - the Tree. I wanted to do something different with two of the tree frames I have, and I printed pictures of all of the "Grandmas" for them. 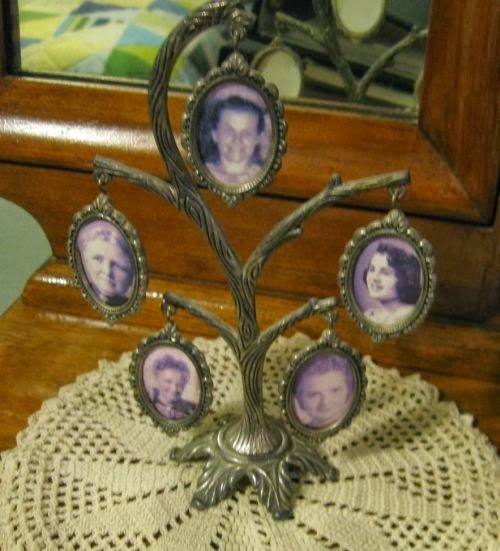 I am using these "Grandma Trees" to teach my granddaughters about the women of their heritage. The five year old knows most of their names, 13 in all, and a little snippet of something interesting about each one. I had another tree frame that was reversible, and I made a gift for my daughter-in-law. 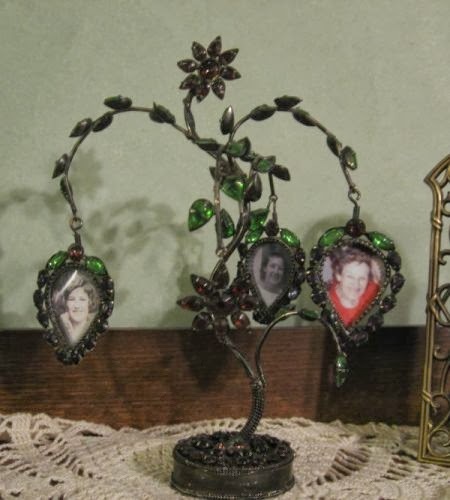 Her photo was at the top of the tree, with her mother below, grandmother, great-grandmother, and great-great-grandmother after that. 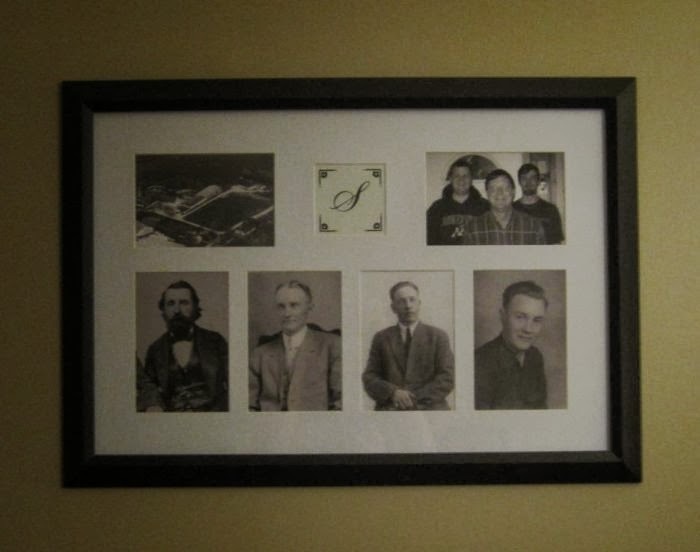 The reverse side held photos of each of her five children. I hope you've enjoyed these ideas, and I would love to hear (and see) what you've done with your old family photos. If you have blogged about this, please put the URL in a comment box below.